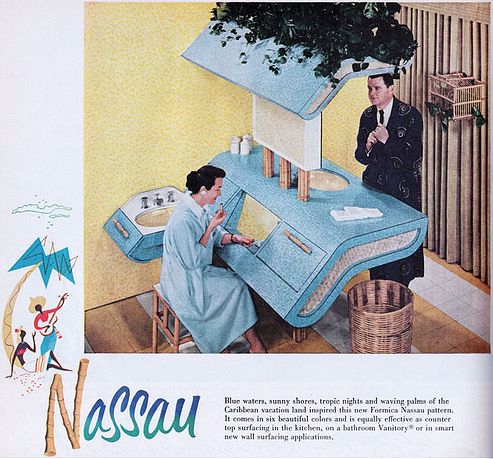 This vision of a separate and very unequal—not to mention bizarre—bathroom was visited upon us in 1957 by Formica. While the strange contours of the 'vanitory' are meant to convey the versatile forming properties of the material, the design seems to play favorites. He gets to stand and face a mirror that's threatened by a jungle of encroaching houseplants. She, comfortably seated, is surrounded—insulated, even—by all the conveniences of a personal boudoir. It's hardly the picture of today's egalitarian master baths, that's for sure. Have we really come a long way, baby?